GENESYS is a global portal to information about Plant Genetic Resources for Food and Agriculture (PGRFA). It is a gateway from which germplasm accessions from genebanks around the world can be easily found and ordered. GENESYS is the result of collaboration between Bioversity International on behalf of System-wide Genetic Resources Programme of the CGIAR (Consultative Group on International Agricultural Research), the Global Crop Diversity Trust and the Secretariat of the International Treaty on the Plant Genetic Resources for Food and Agriculture. By facilitating access to and use of PGRFA, GENESYS helps to secure its long-term conservation. At the launch, in addition to passport data, GENESYS provided access to over 11 million records of characterisation and evaluation data. GENESYS also provides access to millions of records of environmental information associated with accession collecting sites. Its unlimited data capacity allows it to incorporate relevant data from data providers worldwide. Researchers, breeders or indeed farmers seeking specific genetic variation can use GENESYS to select, for example, Triticum aestivum accessions with brown kernels collected in Turkey where the annual precipitation is between 150 and 350 mm. They can quickly do so with only about six keystrokes and 12 clicks of the mouse. The accessions meeting the query can then be requested directly from the holding genebank(s). 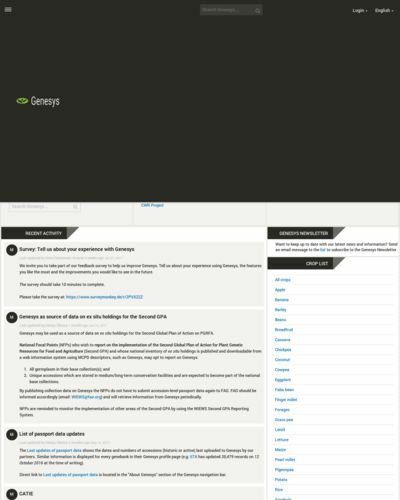 To become a GENESYS data provider, please indicate your interest in doing so and request a copy of the GENESYS Data Sharing Agreement (DSA) from the Genesys helpdesk. The GENESYS team will help you load legacy data and provide the utilities for future additions and updates.